Cryptic developer Heretic posted a sneak peek of the work-in-progress Duty Officer interface today on the forums today. Obviously the interface could still change quite a bit before Season 4 launches, but it does give you an idea of how Duty Officers fit into the game mechanics. 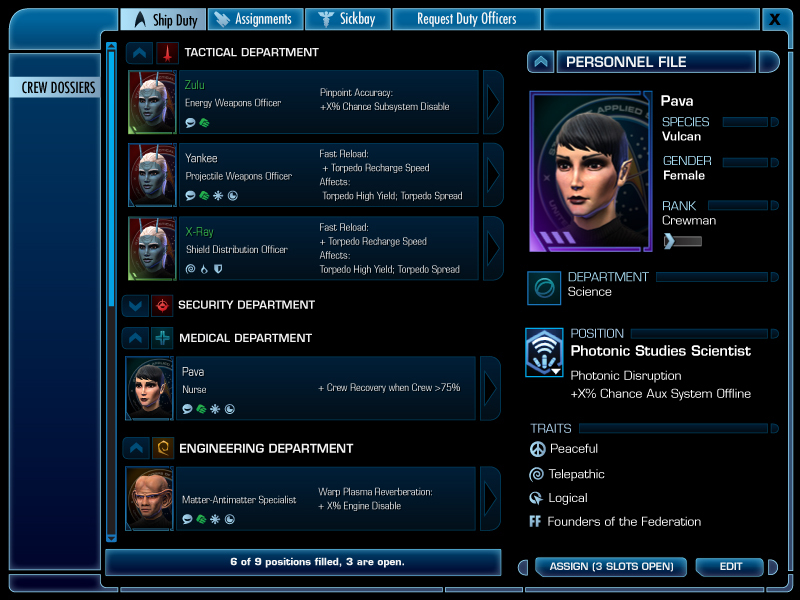 There are limited positions to fill within each department, and each officer assigned adds certain passive bonuses. The traits, shown as icons in the list and detailed on the personnel file, are new to me. I wonder if those are intended as flavor text or possible have something to do with what kinds of missions you can send them on. Season 4 looks like it’ll be amazing, since not only will I have another subsystem to play with in the game, but there’s a (much needed) revamp to ground combat, and some really cool new environments coming based on images Dan Stahl has been tweeting. Ya know, there will always be some man-love in my heart for Richard Garriott but I’ll tell ya… Dan Stahl is creeping up the ladder. Might consider having his man-babies someday at this rate!